Were you looking for the thruster pack? You may also be looking for the antigravity pack, the Halo 4 jet pack or the jump pack, the Covenant versions of the portable jump-jet? "Fly like a bird. Target your opponents. Laugh maniacally." The portable jump-jet, more commonly known as the jetpack, is a user-operated jet engine mounted on the back, developed by the United Nations Space Command. Unlike the thruster pack, which is a maneuvering unit used on deep-space missions, the jump-jet is used for atmospheric low-altitude flight. It is known to be used to an extent by specialized UNSC Marine units, including the ODST Bullfrogs. Unlike the earlier versions, the latest models of the portable jump-jet have enough thrust power to lift more than half a ton, or the equivalent weight of a MJOLNIR-clad SPARTAN supersoldier. The UNSC has also developed safety restraints to be used with the jump jet. The post-war era saw the use of the Series 9 and later the Series 12 Single Operator Lift Apparatus model designed specifically for SPARTAN-IV personnel but also utilized more broadly. 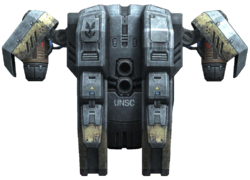 The UNSC portable jump-jet is one of the seven Armor abilities that are available in Halo: Reach. The jetpack can be used for travel purposes, as they may bypass any need to walk up many different buildings, large structures, etc. by flying up to the destination. Flying up high is also effective in combat; when an enemy has a short-ranged weapon, but the jetpack user has a mid to long ranged-weapon, they can fly up high and be out of range of the enemy's weapon. The jetpack is a great tool for defending a person of importance, such as a flag carrier, because the flyer can swoop down on anyone trying to kill that person. It can be used to disorient opponents by flying directly above them and attacking. They may be unaware of where the attack is coming from and die due to being unable to find their attacker. It can be used to reduce fall damage; activating the jetpack before impacting the ground from falling from a high place can save the player from getting hurt or even death. If the user has an Energy Sword, they can act like a bird of prey, flying high and swooping down to slice the enemy. A sword can also be useful against other Jetpackers, as they can use the lunge in mid-air to kill an enemy. As stated above, it can be something of a makeshift parachute if users are in Falcons or Banshees but hijacked or otherwise have to abandon their vehicles, as the jetpacks will cushion the fall. There's some delay after activating before it begins to cancel out a fall. Its flight is slow, and the flyer can only rise and lower, with movement other directions being slower than walking speed. If the operator flies too high without noting the fuel depleting, they will fall from the height and be harmed, possibly dying upon impact or falling out of the map. Using a jetpack makes the operator highly visible, and thus an easy target for ground forces. To prevent this, people should always be aware of their surroundings and motion tracker before they take off for long flights. When in flight, the jetpack makes a lot of noise. This makes enemies immediately aware that there is someone in the area using a jetpack. Jetpackers can hold a flag, but flying makes them automatically drop it. The jetpack is the first propulsion equipment made available to the player in the Halo games. The only similar equipment seen was the Antigravity packs on the Sangheili Rangers in Halo 2 and the Jump packs on the Jiralhanae airborne troops in Halo Wars, Halo 3, and Halo 3: ODST. In Halo: Reach, weapons stored on the player's back when the jetpack is equipped appear to be stored through the thruster casing. It is possible to avoid a fatal Plasma Grenade stuck on the Jetpack by switching armor abilities. The stuck grenade will remain stuck on the jetpack after it is ejected by the player. Concept art for the portable jump-jet. A SPARTAN using the jetpack. A SPARTAN taking flight with the Jetpack. Thom-A293 using a jetpack during a battle against the Covenant. ODST Bullfrogs in action with Jetpacks.